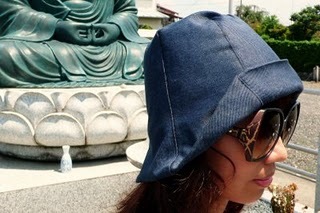 Here’s my contribution to Schnittchen’s Sewing Around The World project. 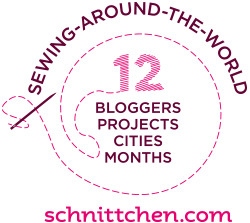 In case you haven’t heard of it, the project features 12 sewing bloggers around the world sewing Schnittchen pattern. My pattern is called Yoga set OHM, it is actually from the Winter 2015 collection. 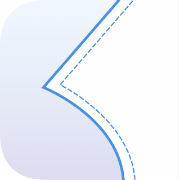 As the name suggests, this is a set of patterns for tank top, leggings, and a sweater made of jersey. 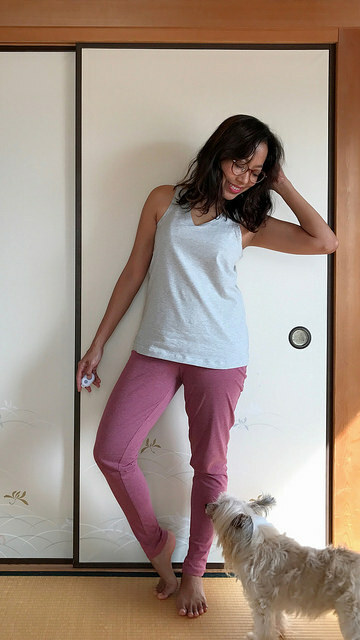 You can wear them for yoga and they are comfortable too for lounging at home. Schnittchen patterns also sent me the fabrics. 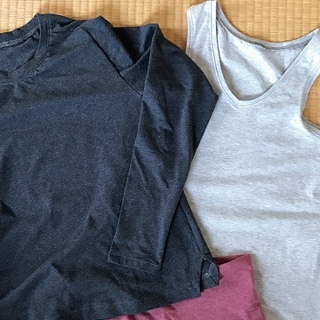 They are organic cotton jersey from Lebenskleidung in Berlin. 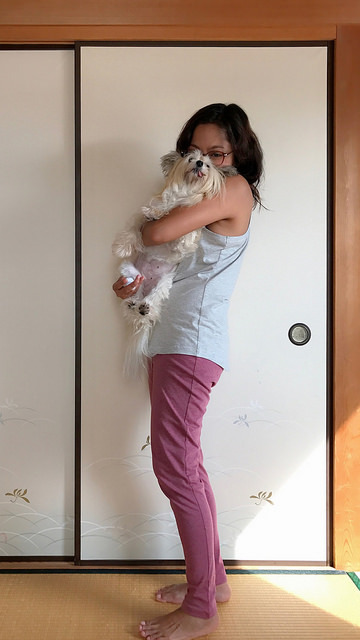 These fabrics are so beautiful and comfortable! These pictures don’t do any justice showing how comfortable they are to my skin. According to the size chart, I fall under size 34. This size is drafted for height 167.2 cm while my height is 150 cm. I like that the size chart also includes height, which is very important to me as I’m a petite. I didn’t find lengthening/shortening lines on the pattern, but it can simply be made by drawing new lines across the pattern perpendicular to the grainline. Since these patterns are very simple, I didn’t make a muslin. Instead, I measured the length of each pattern and compared it to my body to find how much that I needed to shorten. Shortened the leg 4 cm above knee and 4 cm below knee. The waistband for the leggings is way too small. 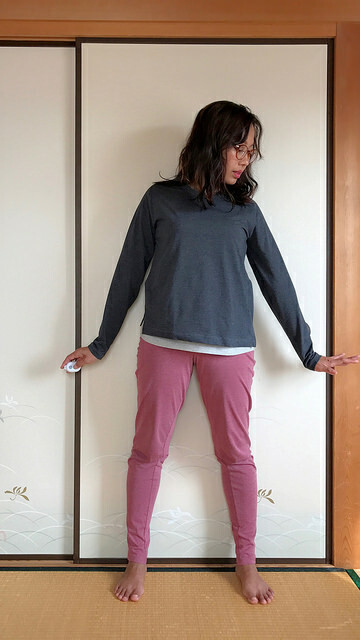 I made new waistband by measuring the waistline on the leg and reduce the width by 85%. 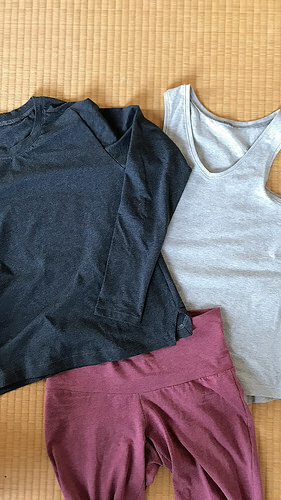 If you’ve already made T-shirts and leggings, these patterns are quite easy and all three can be finished in one afternoon. However, the instructions on this pattern are brief without pictures nor diagram. 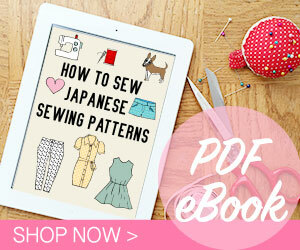 So although the pattern is marked as easy, someone who is very new in sewing might find some difficulties following it. The instruction sheet mentioned that a detailed step-by-step photo tutorial is available at the tutorial page on Schnittchen website. Unfortunately the tutorial is not available yet. I find this a bit disappointing since the pattern was released in winter 2015. Hopefully it will be fixed soon. I also wish that they include stretch factor for the leggings fabric since the drafted waistband for my size is quite small. I think it might need a stretchier fabric. At the end of the day, I’m quite glad to have some comfortable and basic addictions to my wardrobe. I can see these three will get lots of wear! Disclosure: The pattern and fabric were sent to me for review purpose. However, all views and opinions expressed are purely my own.